The sample application goes a little further and fakes a vignette effect by combining the BitmapShader with a RadialGradient. This solution is more expensive because it relies on path clipping; drawing a rounded rectangles directly is going to be more efficient. It also doesn’t provide nice results because path clipping does not support antialiasing and you get jagged edges. Note that the hardware accelerated renderer does not support path clipping at the moment but when it does, it will also be more expensive than just drawing the rounded rect. But it’s the only solution to make a round corner on listview for clipping the textview too, right ? A much cheaper way is to draw a 9patch on top of the ListView. No, a 9patch you draw *over* the ListView. That 9patch contains the outer area of the rounded rect, not the rounded rect itself. Can’t set a StreamDrawable as a view background before 4.1, any workaround beside path clipping ? Hello, i have an question. Why don’t use xml to define corners and use them on background “drawable” ? In list adapter, use an imageview with background’s corner … ? Simon – It’s working just fine on my device. Nice photos, as always, Romain. How do I display the images in the correct proportions? I see in your code that you’re using LayoutParams, but it doesn’t seem to work. Great stuff, would it be possible with a 9patch for the mask instead? Thanks for the post. This will be useful. I noticed though that scrolling on the apk you provided isn’t very smooth. Any ideas on why that is and how to improve on it? @Simon: my APK is built for API level 17. Build from source if you don’t have such a device. @Fritte7: No, it won’t work. The image won’t be clipped by a rounded rect, there will just be a rounded rect behind it. @Marco: The code sample I provide calculates the aspect ratio. @Daniel: The sample uses large images but that shouldn’t matter for the GPU. Are you running the sample in software? As far as I’m aware, it should be running with HW acceleration. I’m running stock Android and have not selected any of the developer options save for activating the adb. To be clear, the scrolling isn’t exactly jerky, but it’s clearly struggling and not as smooth as, say, scrolling the contact list in the People app. Could we use PorterDuffXfermode to create a Path of rounded-rectangle and use a DST_IN to paint the Path? What would be the performance difference between this approach and using a BitmapShader to draw a rounded-rectangle? You can but it takes two drawing passes instead of one. It also doesn’t work on opaque backgrounds. Nice. Can I request a drop shadow as recipe 2? Re: Tim- I’d like to see that too. @Tim: I’ll keep that in mind but these articles take a lot of the little spare time I have so I’m more likely to write about stuff I want :) Note that I try to choose topics that I know matter to a lot of developers. view.setBackground method throws an error .. How do i make this work in a pre Jelly Bean device .. ? thanks a lot for this tutorial and for your source code. I tried to use your Drawable for an ImageView, but this does only work if the ImageView has a fixed layout_width and layout_height. Using wrap_content results in showing nothing at all. Do you know a way to fix this? 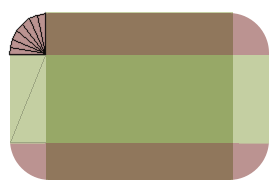 I think the sizes of your drawable are clear (bitmap width and height minus margin). But it doesnt center the bit map.. any better ways of doing this? How could this be adapted to work with a TransitionDrawable? I’m using a “fade-in” image cache. The final image is not always rounded. I need all of the bitmaps in the drawable to be rounded. How’s the memory efficiency of an implementation? I know in the past I’ve strayed away from drawing a rounded bitmap because it would essentially keep 2 bitmaps in memory for every bitmap I was trying to display. From quickly glancing over your implementation, I see a drawable and bitmap that would be in memory for each imageview. Seems inefficient, especially if you were applying this to a large gridview of bitmaps. Ben, this implementation does not use 2 bitmaps in memory. That’s the whole point. The drawable simply draws a rounded rectangle and uses only a few bytes of memory. The only memory usage in this solution is that of the bitmap which you need anyway. Exactly! This solution didn’t use the two bitmaps. Solutions I’ve run across in the past did! That’s why I was curious on the amount of memory usage added by using this drawable. I’m going to do some performance testing on applying this at runtime to a large amount of images in a Grid View. Cool, but this drawable will lose ability to scale if set to imageview as imageDrawable. Is there any way to keep the “ScaleType” in imageview? Thanks. Jason, the ScaleType of an ImageView will work with any Drawable. But after modification form your sample application (add ImageView in stream_item layout, set StreamDrawable to ImageView instead of RelativeLayout’s background). I can’t get any of the scale type work. Just wonder that is there more works to do to support ScaleType? Thanks. What is the license on this code? I’d like to make some modifications and open source a library if you’re open to it. @Vince nice nice nice… I just tryied to do the same. The point is i’m using AQuery + my RoundedImageView, so inside I can scale the bitmap, and after that create the corners… this is using so much memory so… I’m gonna take a look to your solution! Thx! This worked perfectly for me. Just that the image was not scaled within the imageview – may be because an image-matrix was set to ImageView with a dynamic scale. Scale was calculated using intrinsic-width and intrinsic-height. So, just used this – http://stackoverflow.com/questions/14109187/using-a-rounded-corners-drawable#comment19523400_14109187 – and it worked. Romain, thanks for the tutorial. I was trying what you mentioned regarding rounded corners for a list view. In a relative layout, added a imageView which was a square 9 patch and rounded corners with center part transparent. It worked well. However, since the list is long shouldnt it go right uptil the bottom of the list, instead of just the visible section. Can we achieve that without path clipping, is there a way for me to draw the image which would include the translation and scroll amount of a list view? If wrap_content is used in layout, the getIntrinsicWidth and getIntrinsicHeight must be override for StreamDrawable.